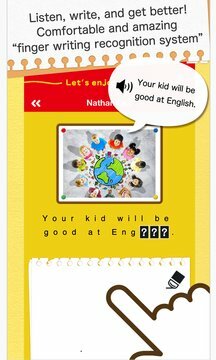 The new series "English" application has joined "FingerWriting Drills" series that you can learn from the fingertip, which is always included in the high ranks in App Store. This application, you have never seen before, provides the environment you can learn English in English only with the beginner English learners! Let's have fun and learn vocabularies and "the sense" of English through seeing, listening and writing"
This application differs from the existing ones and features that you can improve your skill by seeing, listening and writing. No Japanese words show up in the Drill since you learn English in English. But there's no problem! This application adopts the system that you can learn from easy words and learn English by using "images" and "how to use it". In addition, you use the English name to start this application. Let's name in English and get into the world of English from your feeling! You learn and acquire English skills by "writing it" instead of typing in FingerWriting Drill. The excellent handleability and the smooth character recognition provides the marvelous writing feel experience. You are supposed to do 1 drill for 10 minutes a day. You begin to learn from basic familiar vocabularies. You can acquire the English basics naturally by continuing to do the drill and getting accustomed to the sound and the sense of English. You can reach the junior high school level in 1 year and the daily conversation level in 3 years and finally become the level that you can take the perfect score of many tests in 4-5 years. You go through the drill road without getting lost. "The summarization" is prepared at the end of each level so that you never miss the points.